I love it! It's an unexpected place to put them and I like that. This hallway is so narrow that artwork or frames wouldn't work well in it (you should be able to view art or photography from a good distance) so I wanted something of interest. I LOVE the copper. Also, when the light is on at night, it gives off a beautiful warm glow. Very soothing right outside of bedrooms. (do you spy the crack in the ceiling? Um yeah I accidentally did that while in the attic.. it will be patched). Eventually I'll be getting oil rubbed bronze door knobs. And this picture is for those of you who wanted to see the secretary closed! I also ran to Lowe's for some outlet covers, but had a fun time walking around. 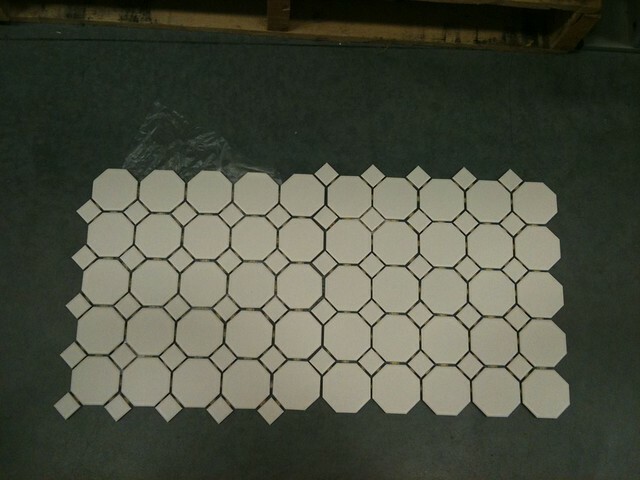 I've been thinking this summer I am going to tackle tile installation. I have heard it's not hard. It's visually interesting, classic AND inexpensive. Definitely right up my alley. I also completely cleaned out the garage this weekend... I'll spare you the pictures of that. But it's nice to finally be able to walk in it without stepping over things! I'll be announcing the March giveaway winner later today! 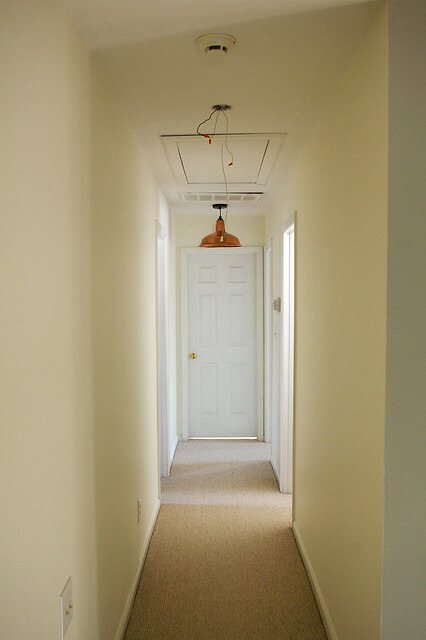 Are you going to paint your hall way now that your pendents are up? I think you need a richer color to really set off your new lights. LOVE those tiles. 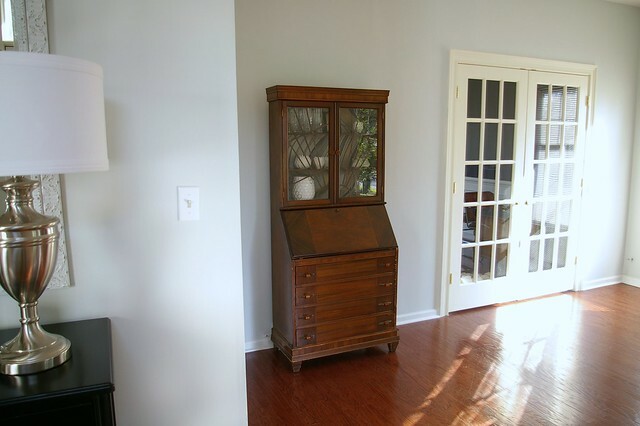 Every time I see the dresser you painted for your entryway I die a little bit from jealousy. 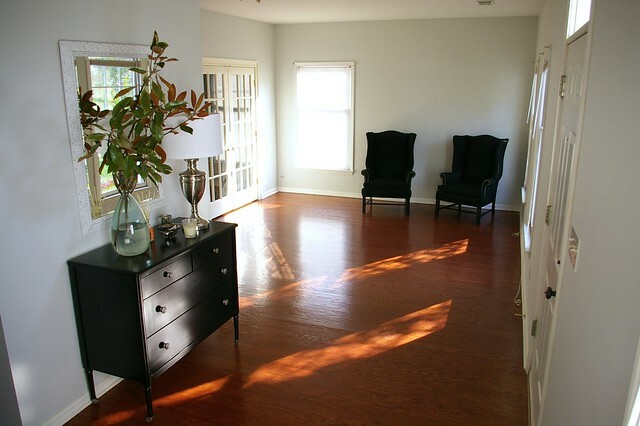 What is the paint color you used in your living room? I love it! The pendants look really good. I can imgaine the warm glow the copper fixtures give off. The copper is beautiful! And you're right, totally adds interest to the hallway. Those tiles will look great. And honey, you haven't seen Casper legs until you see me in summer - come August I still am that pale (thanks, red hair and Scandinavian heritage). 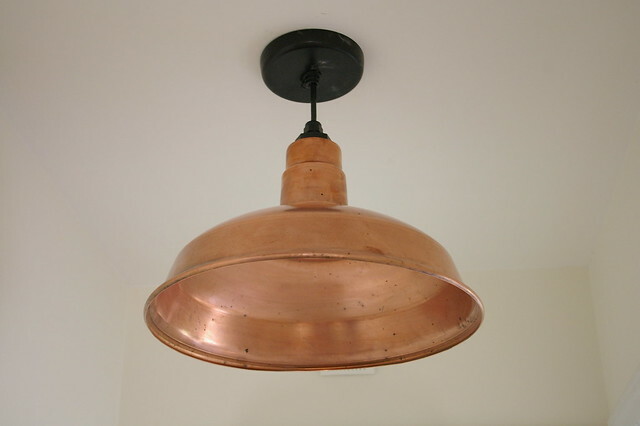 I love those copper pendants - I'm so impress with how productive you are on your weekends! Nice to see that you've got a Casper friendly house! 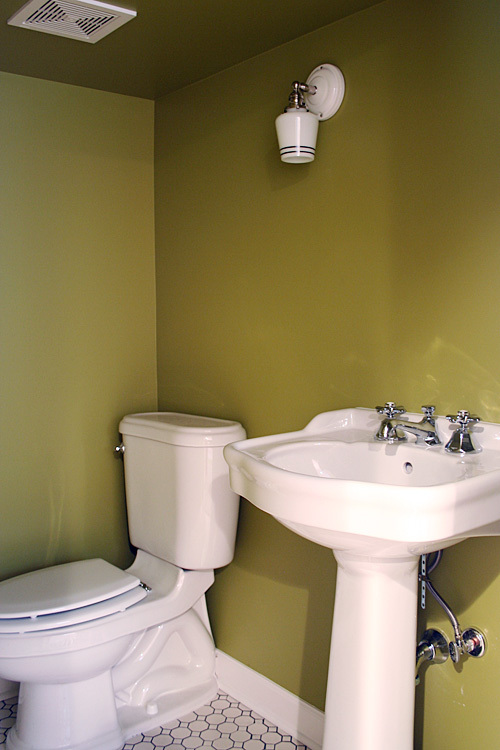 Low pile carpets, wood floors and bath tiles in Casper colors! You got quite a bit done over the weekend. I was going to clean out my gargage, but got a little sidetracked on other things. 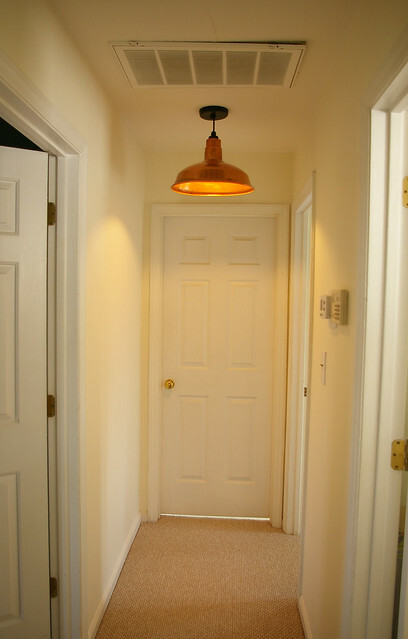 Love the copper lights, so perfect for your hallway. Send some of your sunshine to Seattle, I'm about ready to build an ark. Bryn, the new(old) pendants are STUNNING. I mean, and I say this honestly, they're probably one of the best things I've seen in a long while. And with the light on? Speechless. Your photography is pretty kick-a** too! 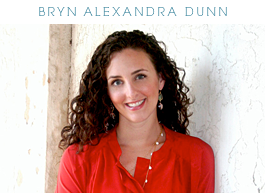 Bryn, I LOVE the copper pendant! They will look amazing/perfect in your hallway! Ah yes thank you so much for the comment! I read your blog post and it was very helpful. I'm excited to do our 2 bathrooms and laundry room!!! The lights look awesome! I saw these in a Restore in KY and I'm kicking myself that I didn't buy them. I stood there pondering where I might put them. Love them in your hallway. Those copper lights are crazy amazing! I love the glow they give off too. Gorgeous and perfectly unique. 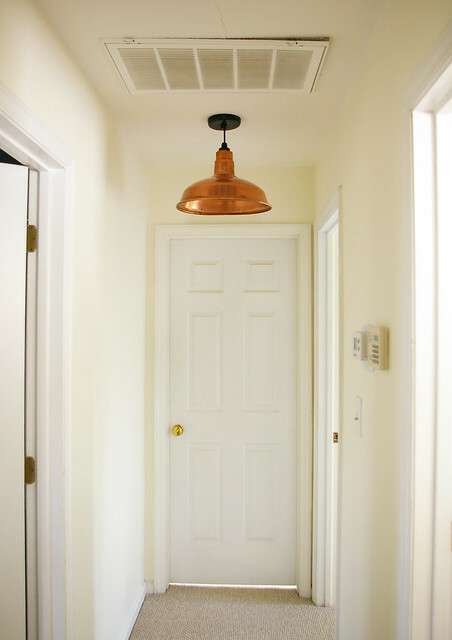 Love the copper pendants-- copper feels so fresh! And what a nice, simple treatment to hang them in the hallway. I spent the weekend cleaning the garage too. It just means more room for design projects! I love those lights! Look so great in a small hallway! i love that you hug the pendants in the hall..the light is so soft and pretty--and you are right, hanging them in the hall is totally unexpected. i love that tile too! a client of mine is getting ready to install it in her upstairs bathrooms. 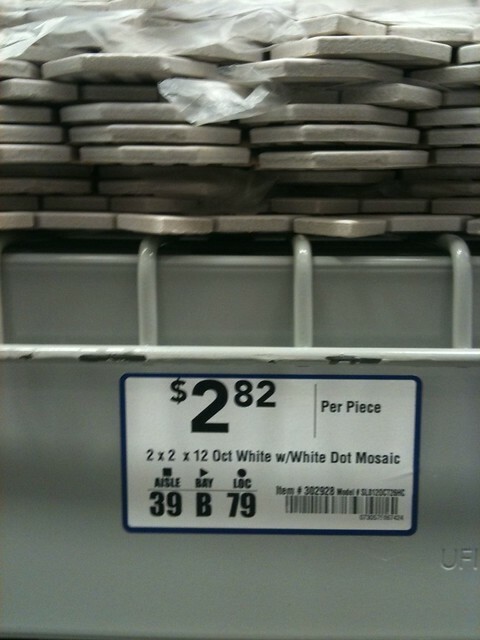 it is a fraction of the cost of similar tiles we looked at. PS. 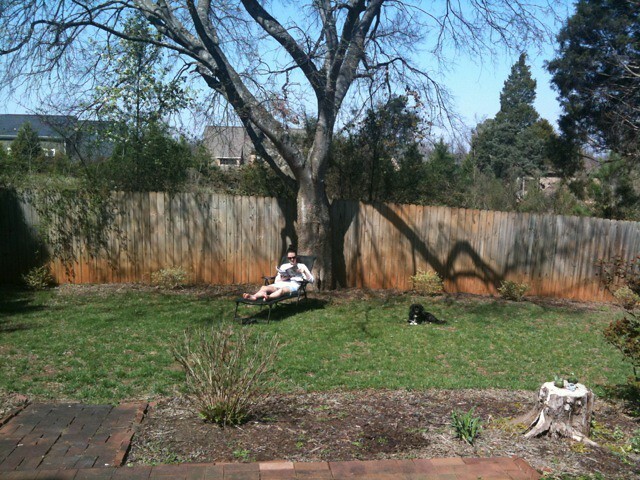 totally jealous of all the trees in your backyard. it looks heavenly. i used that tile in my bathroom reno last summer and am still loving it! highly recommend.